Travelling in Iceland in winter is a whole new experience, as the landscape and famous sights look completely different. Askja Winter Super Jeep Tour gives you a chance to visit most popular touristic locations: Mývatn lake, Askja and a huge volcanic crater Viti. This trip is quite difficult, but don’t worry, you will be accompanied by experience drive-guides and the 4x4 vehicles are specifically adjusted to difficult weather conditions. It is important to note, that you should wear warm shoes and clothes, and it would be better if your outfit would be waterproof as well. The tour approximately takes 11-12 hours, however due to weather conditions sometimes it may take longer. For example, if it is snowing heavily, the group will spend more time to approach Viti volcanic crater. The departure will take place from Tourist information centre at Reykjahlíð (Hraunvegur 8) at 8:30am. Although if you want to be picked from Akureyri Airport, you can have such a service for additional fee (5.000 ISK or €35 per person). The route will set off from Mývatn to Hrossaborgir, where you will enter the stunning area of untouched nature and breathtaking views. There will be several stops, so that you will have an opportunity to take pictures of marvellous Mt Herðubreið. After reaching Drekagil gorge and Askja, the group will stop overnight in mountain huts. The additional bonus to this remarkable experience is a great chance to see Northern lights, as the place is far away from any city lights. So be prepared for thrilling views! 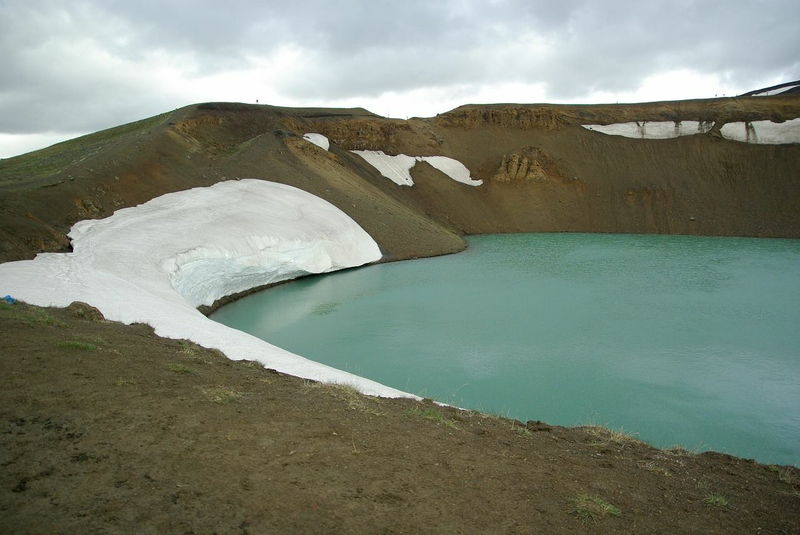 Next morning you will either walk or even ski to Viti volcano crater, another “must see” location in North Iceland. The name means “Hell” in English due to the fact that the water there never freeze. Certainly, exploring Iceland in winter period is challenging, but it is worth it. Skilled guides from Askja Winter Super Jeep Tour will make sure that this trip will become one of the best memories in your life. There is something magical in Iceland, that is coverd by snow, the scenery is completely different and give you imperishable impression. The price for Askja Winter Super Jeep Tour is 139,900 ISK (approximately €990) and is available from October 1 till May 31.